Ashley Mercer, a college student in San Dino, is brutally murdered in the middle of the night, outside her apartment. Alex, her homicide detective brother, and his partner, Stoll, follow a web of death and deceit to find her killer unofficially. An underground cult starts to show its face, taking justice into their own hands, murdering all the people who did not help Ashely the night she was murdered outside her apartment building. Rose, a new homicide detective takes over Ashley`s case, but what the department does not know is that he is more involved in the case than anyone could have ever imagined. Not only was Rose involved with Ashley but also has close ties with the cult that is involved with all the murders surrounding Ashley`s death. Trying to avenge the fact that no one helped his love, things in San Dino get messy, complicated, and no one knows who to trust or who to work with. 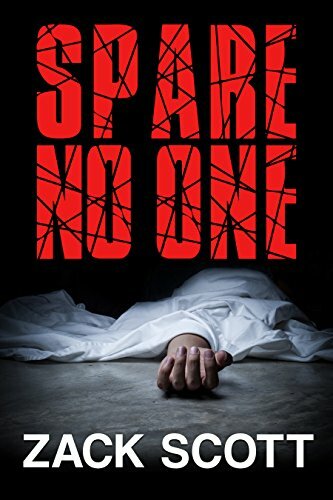 Spare No One is a psychological thriller that captures you from the beginning. From beginning to end the story takes so many twists and turns that at times you think you have it all figured out, and then a new event, perspective, or character is tossed into the story and it completely debunks what you thought you had figured out. The list of characters at the beginning of the book helped as a clarification as to what character fits where in the story. Over all the intricacy of the characters stories was well written and it was clear what role each character played in the story. The end was my favorite part especially because I did not see the story turning out the way that it did. How the past and the present were written together was well executed with little confusion when the switch happened. There are very few things I would change about this story. Even though the switches in time periods throughout the story were over all well executed I would have liked if the title of the chapters were a little more distinct. There were times where I was so engrossed in the story and then a change in the time line would happen and I would have to pause and go back. The other thing was I would have liked a little more of was why the tenants of Ashley`s building didn’t help her. What was a little more of their back story the night Ashley was murdered. Over all it was a great story that captivates the reader from the beginning and keeps you on the edge of your seat the entire book. I would advise anyone who likes psychological thrillers, dramas, and books of the like to read this. It will be worth your time. Posted on June 27, 2018, in Book Reviews, Four Stars and tagged alibris, author, author life, authors, barnes and noble, book, book club, book geek, book lover, bookaholic, bookbaby, bookblogger, bookbub, bookhaul, bookhub, bookish, bookreads, books of instagram, booksbooksbooks, bookshelf, bookstagram, bookstagramer, bookwitty, bookworks, bookworm, crime, cult, detective, ebook, goodreads, ilovebooks, indiebooks, killer, kindle, kobo, literature, murder, mystery, nook, novel, psychological, publishing, read, reader, reading, shelfari, smashwords, spare no one, story, suspense, thriller, writer, writer community, writing, zack scott. Bookmark the permalink. Leave a comment.